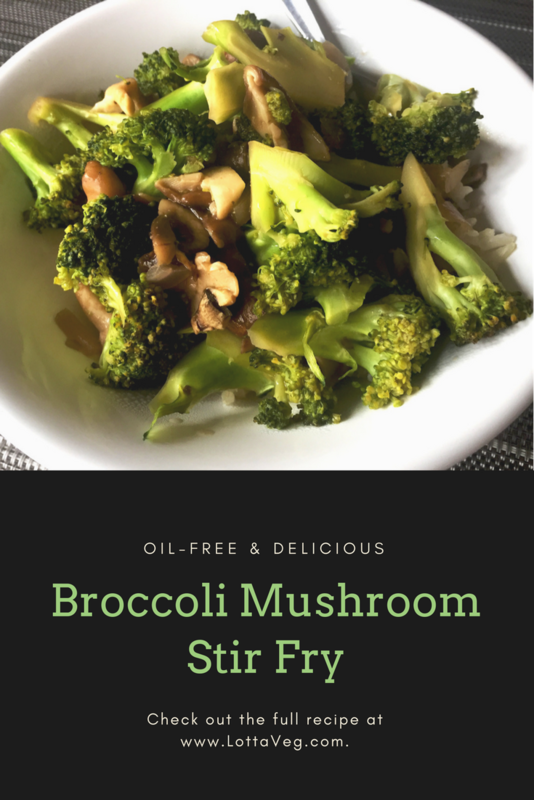 Amelia whipped up this delicious oil-free Broccoli Mushroom Stir Fry recipe so we could use some shiitake mushrooms we found on sale. Since they’re usually so expensive, we rarely buy them, but we love them oh so much! If you can’t find any that are affordable, you can just use whatever mushrooms you have available. We used a spicy Chinese red chili sauce to give the recipe a little extra spice. Feel free to use your favorite spicy hot sauce or try different ones. Based on recommendations from some of our favorite nutrition doctors, we try to avoid oil whenever possible, even olive and coconut oil. While oil does lend a richness to food, its long-term harmful effects to our arteries and the weight gain associated with such a dense source of calories sour the taste a bit. That’s why most of our stir fry recipes use vegetable broth instead of oil to “steam fry” our veggies. The key is to cover the pot between stirs to trap the moisture so the veggie broth doesn’t evaporate and your veggies don’t dry out. 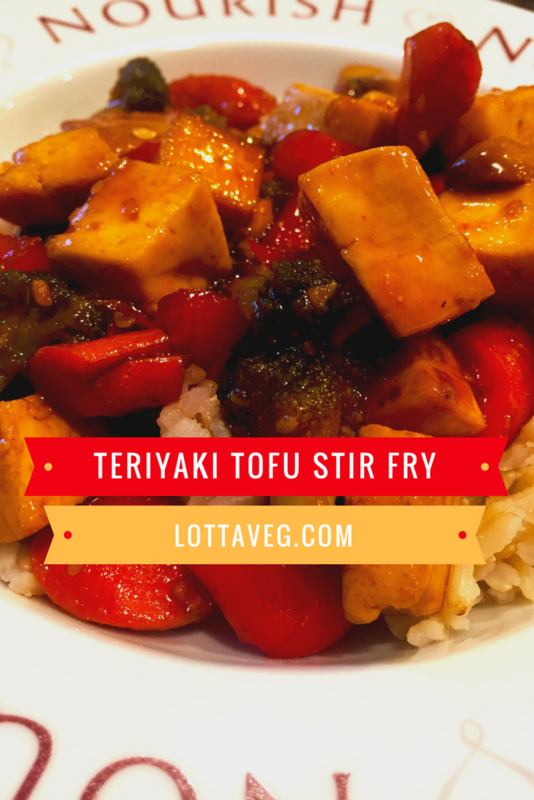 This is a good one dish recipe, but you can also serve it with some delicious Vegan Miso Soup. 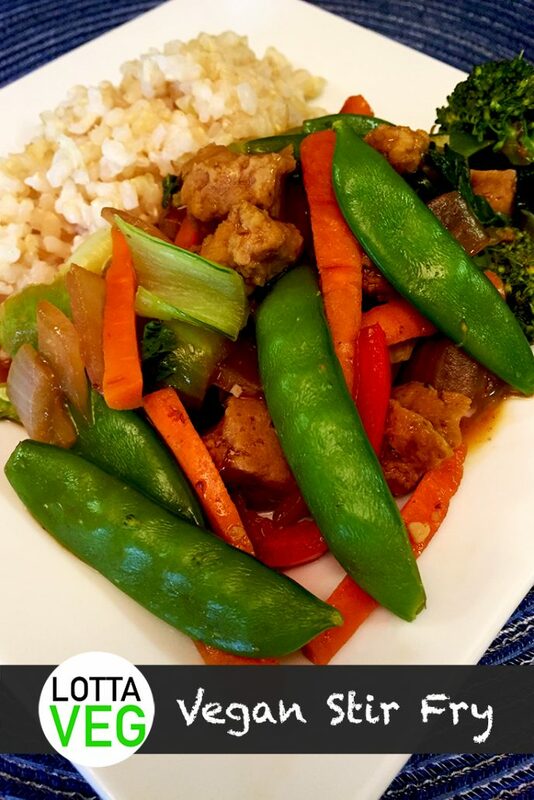 Amelia cooked this Vegan Stir Fry about 8 times before she was happy with its flavor and veg composition. This one is all hers and it’s delicious! 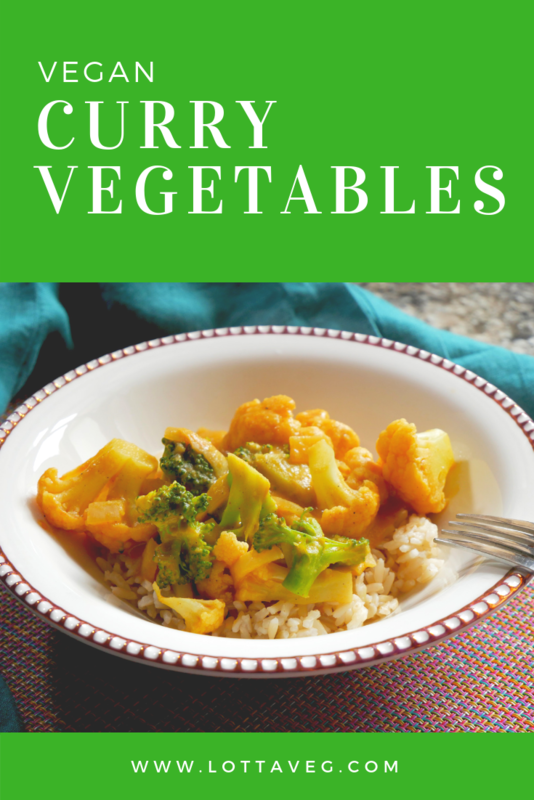 We used fresh ingredients in this recipe, but if you’re in a hurry or hate chopping up a bunch of veggies, you can use a variety of frozen veggies or a package of mixed veggies. We use frozen mixed veggies quite a bit for this recipe, especially when we’re short on time. I prefer eating it over brown rice, as this recipe calls for. But we also like it over Tofu Shirataki Spaghetti Noodles, spaghetti squash and spiralized zucchini. Amelia made it a lot, so we tried it with a lot of different things. Amelia cooks this recipe in a skillet over medium heat covered to keep the veggie broth from evaporating too quickly. If you’re using a wok, the cook time will be less so keep that in mind. If you want to make this gluten-free, substitute the seitan with sliced mushrooms. That’ll keep it a similar color and texture. This recipe originally used a teaspoon of sesame oil, but since we’re not eating oil anymore, we removed it. You can add some sesame seeds to this dish to get a similar flavor. It’s a good idea to slightly toast them in a skillet before adding them to your recipe to release the oils and flavors. This Oil-Free Broccoli Salad is one of Amelia’s all-time favorites and now it’s one of mine too. It certainly fits Amelia’s fresh and delicious requirements, but it’s also nutritious. It has 4 grams of fiber, 4 grams of protein and 161% of your RDA of Vitamin C.
Broccoli is best consumed raw or lightly steamed to maximize the nutrient value. We like to lightly steam the broccoli because we don’t like it as much raw. Plus, steaming brings out the bright green chlorophyll colors! This cruciferous vegetable is also loaded with sulforaphane, which is an important phytonutrient that has been shown to help prevent and fight several forms of cancer. However, the sulforaphane appears to be deactivated by cooking unless you chop the broccoli into small pieces about 40 minutes before cooking. That requires a little extra planning, but it’s not difficult. You can chop the broccoli during your fruit and veggie prep and store it in the fridge until you’re ready to make it, or just chop it up about 40 minutes or so before you want to start cooking and leave it on the cutting board until you’re ready. Cruciferous vegetables like broccoli, kale, cauliflower, cabbage and brussels sprouts are potent immunity boosting and cancer fighting foods so it’s a good idea to consume a least some of them every day. 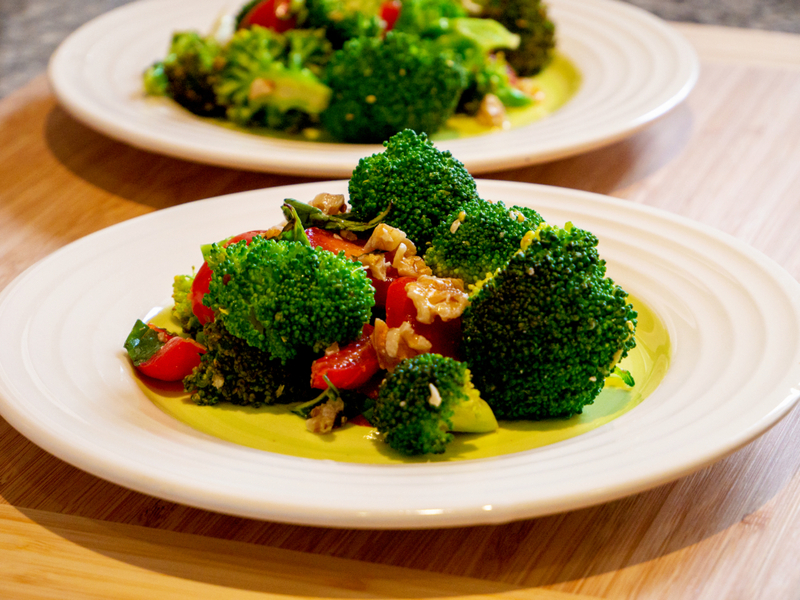 We put kale in our Easy Garden Salad, and broccoli would be a nice addition to that recipe, too. If you have a discerning eye, you may notice that we used walnuts instead of pecans for our photos. We prefer pecans in this recipe, but we haven’t been able to find any here in Ecuador. Plus, walnuts are very affordable here compared to most other nuts, so we eat them far more often. Feel free to use your favorite unsalted, raw or dry-roasted nuts in this recipe. 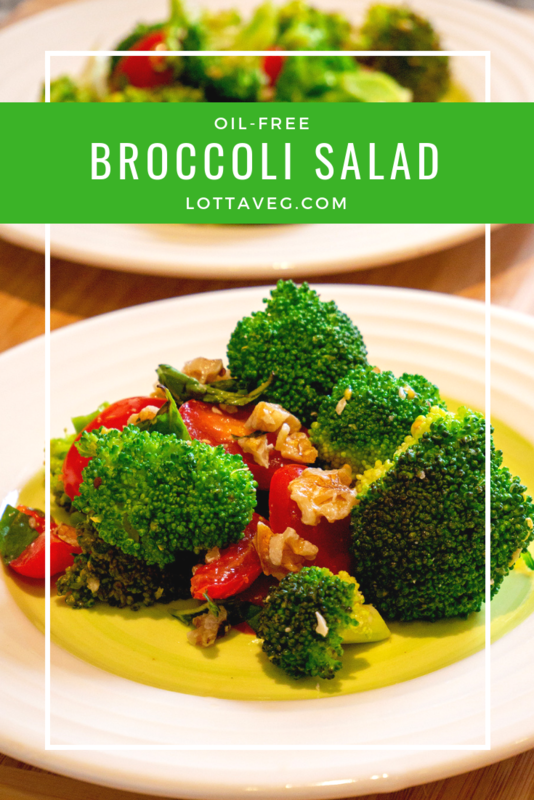 We love this Broccoli Salad on a hot summer day with fresh broccoli and tomatoes, but it’s good all year round. We generally eat it as a side dish with something like a Vegan Lentil Burger, but it’s great as a lunch meal with a slice of bread or a small bowl of White Bean Soup followed up with some fresh fruit. 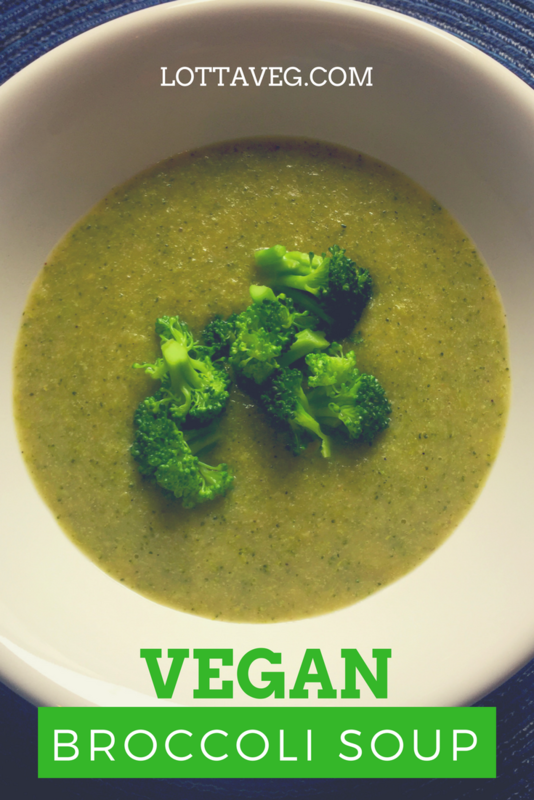 Steamed broccoli is a staple in the vegan diet, and it’s super fast and easy to make. 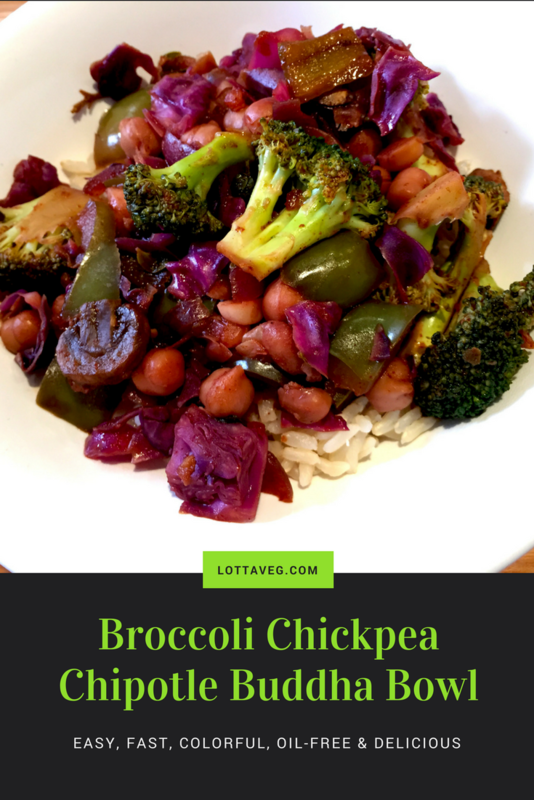 Each serving of this recipe has only 64 calories, but packs in 5 grams of fiber, 5 grams of protein and a whopping 275% of your RDV for Vitamin C. A lot of that comes from the lemon juice, which is very high in Vitamin C.
Broccoli is a cruciferous vegetable along with kale, cauliflower, Brussels sprouts, bok choy, cabbage, collard greens, rutabaga and turnips. These veggies are packed with nutrition but low on calories. If you’re trying to lose weight, stock up on these veggies and eat them as much as you can. 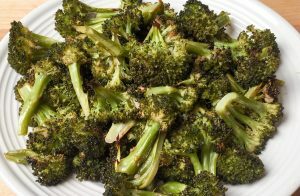 This Roasted Broccoli is a quick and easy way to make broccoli taste great. 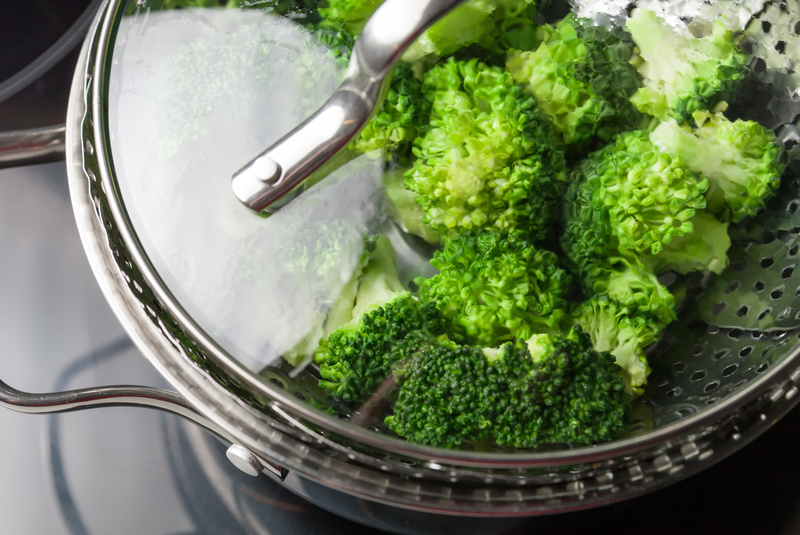 It only takes a few minutes to prepare and broccoli is a great source of vital nutrients like fiber, protein and Vitamin A.
I’m a big fan of broccoli. I like it raw, steamed, in soup…you name it. But this Roasted Broccoli with Garlic and Lemon Juice recipe is by far my favorite. I could sit on the sofa and eat those little crispy florets like potato chips! We tried cutting out the oil and just using vegetable broth, but they didn’t taste nearly as good. Plus, they didn’t have the crispiness that we like, so we decided to leave the oil. Each serving still only has 128 calories. Using aquafaba may work in place of oil, but we haven’t tried that yet. Let us know if you do! 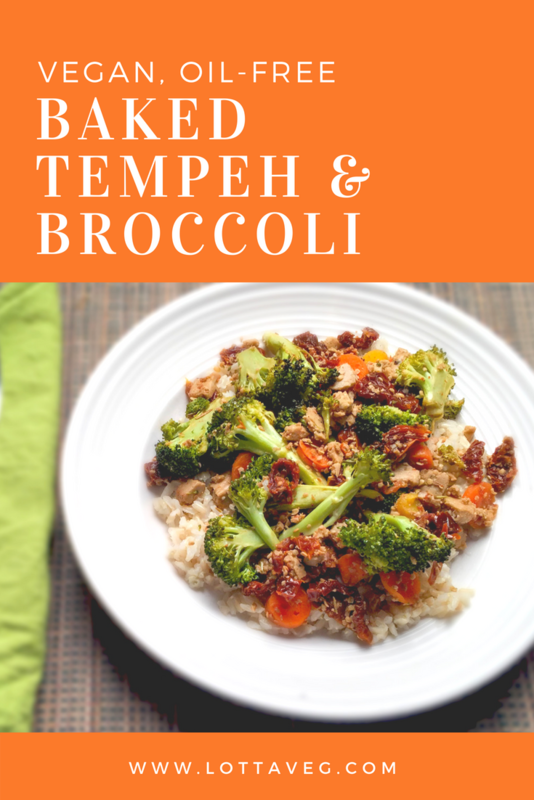 This Baked Tempeh and Broccoli recipe is a colorful, healthy plant-based meal with ample leftovers for busy weekday meals. It’s somewhat like a stir fry in it’s look and texture, but you bake it in the oven instead of in a wok or on the stove. Tempeh is a minimally processed soy product that’s also high in protein. Each serving for this recipe has 11 grams of fiber, 15 grams of protein, 155% RDV of Vitamin A, 126% Vitamin C and 19% Iron. That’s a lot of nutrition for 299 calories making this a great weight loss recipe. We put the Baked Tempeh and Broccoli over brown rice, but you could eat it plain without rice, with white steamed rice, or put it over spaghetti squash to cut down on the carbs and calories.